Our unique Guesthouse is perfectly located right in the heart of the Trinity Bellwoods neighborhood in Toronto, (second hippest area in the world, according to Vogue Magazine). Being ideally situated just south of always vibrant Queen Street West our guests need only to step out their door to be right in the epicenter of trendy Toronto. Fantastic restaurants, great bars, more art galleries than you can shake a stick at and minutes from the lake. Our Guesthouse is a private residence. The guesthouse has just been completed, Everything is brand spanking new. The house is incredibly quiet and you wouldn't know you are only steps from the excitement of Queen Street West. In the summer you can use the courtyard garden to relax and even fire up the bbq if you feel like it. IMPORTANT: Although the property can accommodate 4 guests, there is an additional fee of $60.00 per guest, per night over 2 guests. If you are bringing a pet please note that there is a $50.00 pet fee. These fees can be paid by electronic transfer or by PayPal prior to your arrival. We have installed an electronic key pad. Access code will be supplied once booking has been completed. Temporary street parking permits are available. These can be nightly or weekly. If you are driving you will require a parking permit. Please just search temporary Street Parking Toronto and you should find out how you can create and print the permit you require. If you are having trouble doing this please let me know and I can assist you. We are home most evenings and are always available to our guests. Whether you need advice on where to go, which attractions we think you might like or just want to have a chat and a glass of wine please feel free to knock on our door. Toronto was designed as a grid, and as you get further from downtown, the neighborhoods become looser and larger pieces of the city. The inner city neighborhoods are all woven closely together, forming a colorful and lively scene of city life. When you walk around Toronto’s inner city areas, you will definitely find yourself exploring Trinity Bellwoods. Residents and tourists love it for it’s popular park, restaurants, and shopping venues. If you’re looking for a central Toronto neighborhood with effortless style and charm, then Trinity Bellwoods could be the best place for you. We are a busy couple with 3 children. Two are away at University (yay!!) with our youngest still at home. We run our own business and spend the winter weekends at hockey rinks with Sebbie and the summers is spent getting ready for the hockey season. We really enjoy exploring our great city and are currently in our theater phase. We really look forward to welcoming you to our city and we are certain you will enjoy your own private space to unwind after a great day/night exploring. The coach house has just been completely renovated. Everything is brand spanking new. The house is incredibly quiet and you wouldn't know you are only steps from the excitement of Queen Street West. In the summer you can use the courtyard garden to relax and even fire up the bbq if you feel like it. 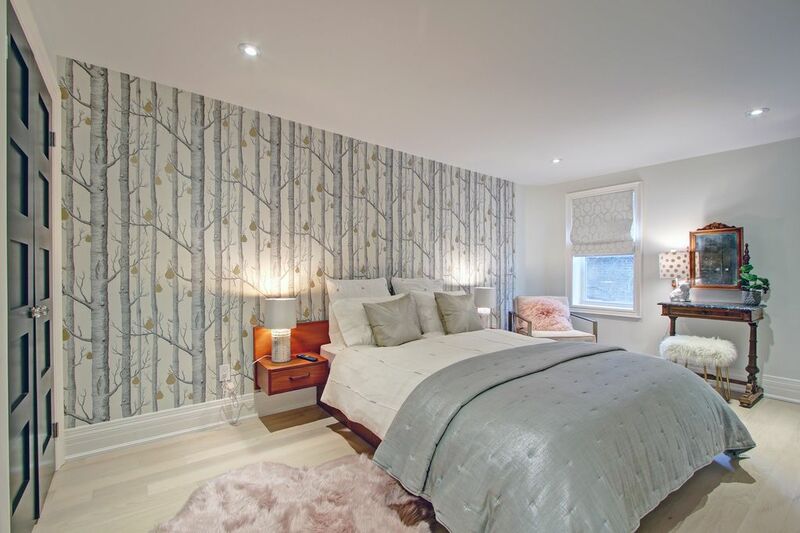 The coachouse is located right in the heart of Trinity Bellwoods. Experience the amazing bars, restaurants, galleries and shopping literally seconds from your door. On street parking is available. Permits available online. Very nice converted Coach House in great location close to Queen Street. Close to lots of great restaurants and bars in the evening, and a wide variety of individual shops in the day time, think interesting one-off shops not the standard chains that you see in other parts of the city. Steve and Victoria were great hosts and very responsive during the booking process and during my stay. I will definitely stay here again and would thoroughly recommend it to others. lovely cosy retreat but within walking distance of some good restaurants and shops. very quiet you wouldn't know you were in a city. great shower and comfy bed. good kitchen area but we only used it for making drinks and a couple of breakfasts! Steve and Victoria were lovely and very helpful, Thank you both for a great stay in Toronto! We stayed at the property in October 2018 for the Toronto Waterfront Marathon. The location was ideal, the guesthouse was just perfect: tastefully decorated, clean, modern and comfortable. The hosts could not have been friendlier and more accommodating. Perfect stay overall! Steve & Victoria were very accommodating and just lovely ppl. Would stay again, for sure. This guesthouse is perfect in every way. It's exceptionally clean, beautifully decorated and had everything needed for our stay. The location is just as great as it's walking distance to Trinity Bellwoods Park (2 minutes away), countless restaurants, bars & shops. Highly recommend this property! The place was clean and comfortable and in a nice neighborhood. We got weekly transportation passes so taking the Queen St. and King St. street cars was very convenient. Steve was a gracious host. Hope to return. Our unique Guesthouse is perfectly located right in the heart of the Trinity Bellwoods neighborhood in Toronto, (second hippest area in the world, according to Vogue Magazine). Being ideally situated just 5 houses south of always vibrant Queen Street West our guests need only to step out their door to be right in the epicenter of trendy Toronto. Fantastic restaurants, great bars, more art galleries than you can shake a stick at and minutes from the lake. Our Guesthouse is a private residence. Although pets are welcome, there is a $50.00 fee that takes in to account the extra cleaning necessary to maintain the high standards of the property. Although the property can accommodate up to 4 people there is an additional charge of $60.00 per night - per guest over 2 people.